Cocoa Brownie Cookies, deliciously Gluten Free! This is an outrageously decadent recipe, that will perfume the house with a chocolate. It's no secret that I've been cooking for the gluten free crowd these days and have really been having a good time figuring out solutions in the baking department. I'm a big fan of cocoa and I sorta feel like it's a health food (if you forget about all the sugar) and these brownie cookies are a real treat. The egg whites help give body to the cookie, sorta like a meringue. Chopped nuts, a dash of espresso or chocolate liquor make these cookies simply irresistible. Preheat to 350°. Whisk powdered sugar, cocoa powder, and salt in a large bowl, then whisk in egg whites and whole egg; fold in chopped chocolate and cacao nibs. Spoon batter by the tablespoonful onto cookie sheets, spacing about 2” apart. Bake, rotating cookie sheets about halfway through (back to front, front to back, top to bottom) until cookies are puffed, cracked, and set, about 14–16 minutes. Transfer cookie sheets to wire racks and let cookies cool on pan for about 5 minutes. Enjoy on it's own or if you dare, with vanilla ice cream! Recipes run through my head a lot. I'll get an idea about something and then my imagination just takes over. I start thinking about all the different approaches I could take, flavors that go together and then I start looking up recipes. It's both a blessing and a curse. This obsession, however, led me to make several different versions of an almond and orange tea cake, with the following being my favorite. This recipe also happens to be gluten-free with the use of almond meal, which is a lovely flour replacement, and it doesn't have any of those chalky flavors I find with many of the gluten-free flour replacements. A cup of almonds meal is a cup of almonds, simple as that! 1. Wash the oranges and cover them with water in a medium sized pot. Boil until soft, about 30 minutes. 3. In a food processor puree the oranges until smooth, removing any seeds you may find. 4. In a large mixing bowl, beat the eggs until thick and add the orange puree, ground almonds, salt, sugar and baking power. Mix well. 5. Grease a 9 inch cake pan and pour batter into pan. Bake for an hour or until the center is firm to the touch. Remove from oven and allow to cool. *Navel Oranges or Clementines work well too! If grinding your own almonds, simply do so in your blender or food processor before you add the boiled oranges. Socca or Farinata has recently become popular among the gluten free community as its a quick way to get your pizza fix without that pesky gluten. I first heard of socca when I was in La Spiza, Italy. We wandered into a hole in the wall pizzeria and ordered a quatro fromaggio pie but noticed that all the locals seemed to be eating this mysterious chickpea pizza. I had to know what all the fuss was about. The key to an excellent socca is a well seasoned skillet, good chickpea flour and tasty toppings. I got my first recipe from my girl Grace over at Food Fitness Fresh Air and made it for a lunch at the farm. It was a big hit. Socca seems intimating but it really is a painless process. Simply make your batter with equal parts chickpea flour and water. Heat your skillet under your broiler, pour in batter, cook until golden, and top with whatever please! Enjoy! Combine chickpea flour, water, 1 1/2 Tbsp. olive oil, a pinch of salt, and pepper to season. Set aside for and allow to rest. Prepare pesto. Combine ingredients in food processor and gradually add olive oil. Blend until desired consistency is reached. Preheat broiler. Allow a 10 inch cast iron skillet to heat under the broiler for 5 minutes. Carefully remove skillet and pour in chickpea batter. Return to broiler and cook for an additional 5 minutes or until golden brown. Top with pesto and cheese, sausage and other veggies. Enjoy! Being on the west coast lends itself to being on top of the season back east. Though blackberries haven't hit the vines just yet, their blossoms are starting to kick off and preserves from last year help us remember whats in store this summer. We have some gorgeous rhubarb growing in the garden and other than just admiring its red stalks, it is also delicious. Rhubarb I find alludes most people as it seems stuck somewhere between celery and a strawberry. Rhubarb is a rhizome that can add wonderful texture and flavor to a dish, of course strawberry rhubarb is a classic combination, but it can also stand on its own. When using rhubarb you want to be sure to remove the leave, as they are poisonous, and be sure to wash off any sand or dirt left on the stalks. Rhubarb is very well behaved and simply disintegrates on high heat on the stove. If you don't have any preserves on hand and want to keep it seasonal you can nix the blackberries and just make this a rhubarb crumble. This crumble is also gluten free and once again no flavor is lost with some easy substitutes! In a medium sauce pan, combine all ingredients and simmer until rhubarb breaks down, about 10 minutes. Reduce until thick. Set aside. Preheat oven to 350. In a food processor, combine almonds, oats and dates. Pulse until combined. Remove half mixture and in a 8x8 baking dish, press half of almond mixture on base to form a crust. Melt 4 tbsp butter and pour over mixture. Return other half of mixture to processor and pulse remaining butter until it forms small pea-like balls. Pour blackberry rhubarb mixture on top of crust and sprinkle remaining date mixture atop creating a streusel. Bake for 20 minutes or until streusel is golden. Enjoy with fresh yogurt, whipped cream or ice cream! Chocolate is one of those alluring ingredients that inspired me to create something simple and decadent when Camp Joy Gardens, a small non-profit organic farm in the Santa Cruz Mountains of California, received 25 pounds of cocoa powder in their bulk order. 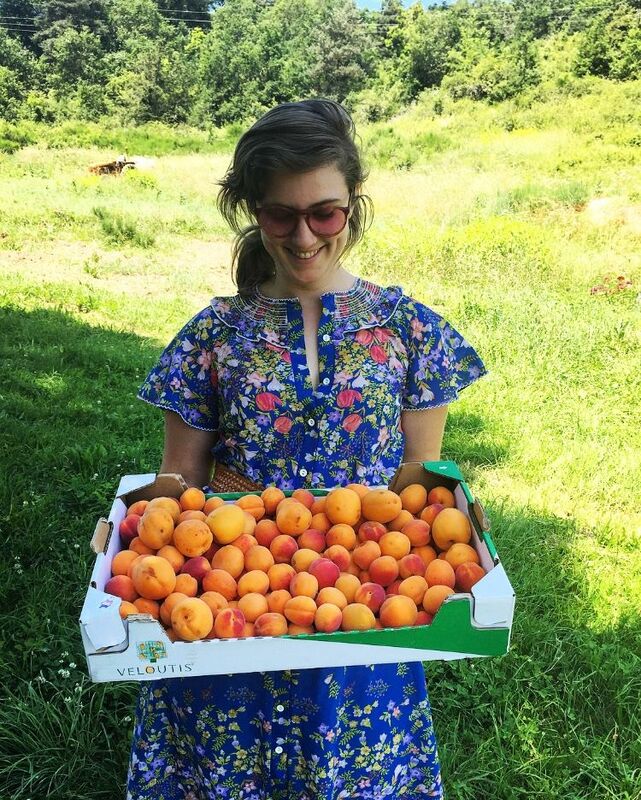 The beautiful 4 acre farm is run through an apprenticeship program that is greatly influenced by Alan Chadwick's model of biodynamic organic farming techniques. I was fortunate enough to be welcomed into the program and have been overcome with splendor, as food is a communal affair and everyone gets to create wonderful meals from the fresh produce we grow. I really wanted to keep this cake gluten free, as one of my peers is intolerant. With most dietary restrictions, it’s difficult to retain the integrity of a recipe without using a substitute that hinders the flavor. This wonderful snacking cake however gets too much of its flavor and texture from the ground almonds and is completely gluten free without anything being lost without flour. You may notice that this recipe is also written in grams. Within the last couple of months I have become fond of working with a digital scale when baking. When you multiply a recipe, proportions can easily be thrown off and working with a scale takes the guess work out of multiplying a recipe, and helps you remain exact, which is so important in baking! Preheat oven to 350 and grease a 8 inch cake pan. In a double boiler, melt down butter and add chocolate. Once melted remove and allow to cool. In a bowl, separate eggs into whites and yolks. Whisk the egg yolks, half of the sugar, yogurt, vanilla, and salt, stir in melted chocolate. In a food processor pulse almonds until fine and add in the buckwheat flour. Stir into chocolate mixture. In a mixture (or by hand if you want a work out!) whisk egg whites until soft peaks form, add the remaining sugar and beat until firm peaks form. Slowly fold into chocolate mixture. Scrap bowl into greased pan and bake for 25-30 minutes. Center should be slightly soft. Cool and remove from pan and dust with powdered sugar & cocoa powder. Enjoy with a scoop of ice cream for added decadence! * I used semi-sweet chocolate chips, but dark chocolate would be amazing as well.